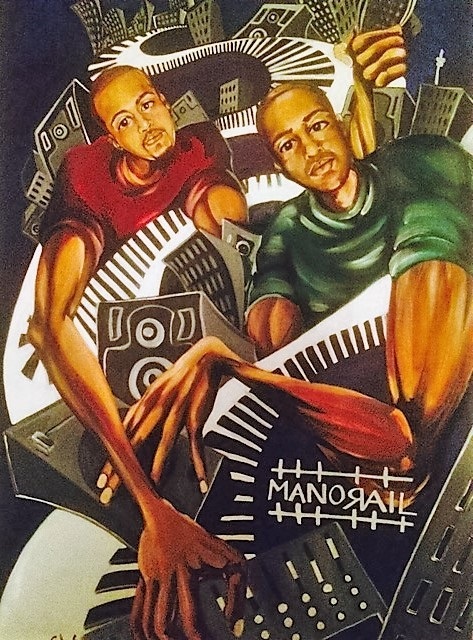 Shish (Martin Caba) ,Atrane (Edwin Caba) & Sed (Marco Escobar) are a New York based musical group and production collective called The Manorail. The Spanish word for brother is Hermano, Rail is synonymous with tracks. Put the two together and you get The Manorail, brothers who make musical tracks. The Manorail are a throwback to the 90's, we're talking boom bap, vinyl diggin, cassettes, crunchy drums and dirty samples. Their ultimate message is Mass Transit Music for universal listener's ears. Shish & Atrane were born in The Dominican Republic and raised in the Rutgers Houses; The New York City Housing Authority projects located on the Lower East Side of Manhattan. During these formidable years, Shish and Atrane met their lifelong mentor and collaborator JFR (Jeff Otero; Music producer and founder of Eyegrustle video and photography crew). JFR was a DJ, MC and B Boy that co-founded the Scrambling Feet Rockers breaking crew and Got The Fame (GTF) graffiti crew. As fate would have it, Shish and Atrane met another set of Dominican American brothers in the Rutgers Houses named Fokis (William Heredia; Founder of Loyalty Digital Corp, music producer and recording artist) and Dark Blue (Carlos Heredia; Musician, recording artist and actor). Under the guidance of JFR, a lifelong musical fellowship rooted in the elements of Hip Hop was formed. After both graduated from Seward Park High School, Atrane attended New York City Tech and Shish left to attend SUNY Binghamton where he met Sed (Marco Escobar), a Salvadoran American born and raised on Malcomb Road in the Bronx, New York. With SUNY Binghamton's college radio station WHRW serving as a guiding force, Shish, Atrane and Sed began their musical education listening to thousands of hours of vinyl records, recording their early demos and gradually becoming fluent in multiple musical genres. Shish, Atrane and Sed went by numerous aliases until they became The Manorail.